Grew Up... as Seven of Nine, Tertiary Adjunct of Unimatrix 01. 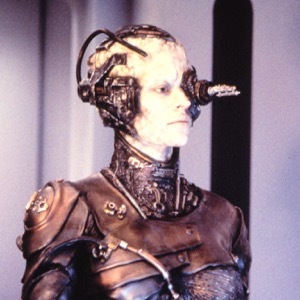 A human at birth, Seven was assimilated along with her parents by the horrifying Borg Collective at the age of 6. From that time, she served the collective as a faithful drone until being severed from the collective during an encounter with U.S.S. Voyager. Living... in Cargo Bay 2 aboard Intrepid Class Federation starship U.S.S. 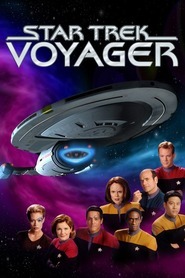 Voyager, in a special alcove where she can regenerate faster than normal humans. Her Borg enhancements provide her with greater visual acuity, intricate knowledge of complex systems, and a resilient attitude. But beneath all that, according to Captain Janeway, may be a child who never had the chance to thrive as an individual. Visiting... the Delta Quadrant, on a 50+ year journey back to the Alpha Quadrant, and her home planet of Earth. The Delta Quadrant is home to the Borg Collective, and Seven’s unique insight will ease the ship’s journey home. Profession... advisor to Captain Janeway and the Voyager crew, often in the tactical sense, through the ship’s many encounters with the Borg. She improves many of the ship’s systems using technological advances known only to her. Together with Harry Kim, she also designs a new Stellar Cartography department aboard the vessel, via which she can plot shortcuts and more direct routes home. Interests... for Seven, as she has put it more than once, “fun is irrelevant.” It would take significant urging from Captain Janeway and the other crewmembers for Seven to develop any recreational hobbies, as she mostly spends her time optimizing the ship. Personality... intelligent, cautious, and loyal. While Seven may be relatively new to the idea of “being human,” her unique detachment from social conventions such as gaming or gossip allow Seven to keenly surmise more about those acts than if she practiced them. She has quite a lot to offer Voyager, if only she would allow herself to embrace the adventure. Seven of Nine's popularity ranking on CharacTour is #1815 out of 5,000+ characters. See our top-ranked characters and read their profiles.